We spent our first night at the cottage last night. We puttered around planting pole beans, daisies, and morning glories. I thought it was a bit cool to make sugar water for the humming birds but I said, let's give it a try. So we cooked up the syrup, let it cool a bit and hung it out. I'm sure it was less than half an hour before I heard the familiar wizzz of a hummer. I was lying on the deck enjoying a bit of late afternoon sun, and I just smiled to myself. I can't tell you how much time I've spent over the past 5 years, with my camera pointed at that darn feeder trying to get a perfect picture. Well, today, I did get a picture of this little cutie, but she was on the other side of the feeder. Do you see her wing? Here's my recipe for hummer nectar. Mix together and let it cool. Thanx for sharing the recipe. 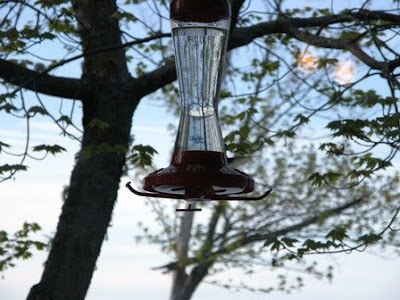 I too love hummingbirds and have thought to get a few glass feeders to deter the squirrels from nawing them to shreds. Thanks for posting your recipe. We've barely gotten the winter feeders down! Bees like this sugar syrup also - last summer someone emailed me pictures of honeybees at her hummingbird feeders! We have had our feeders out for two weeks. Scott and I were on the deck on May 9 and a hummingbird whizzed by us, and then stopped and came back and hovered for a minute as if to say... I am back... get with it!! !